In this blog post , we will cover 2 of the cool windows phone 8 apps called “Navagraha Kritis” and “Melodic Chants”. Navagraha Kritis is Bombay Jayashri and her students and the app is published by Nextwave Multimedia Pvt Ltd.
Navagraha Kritis includes seven striking compositions each one of them dedicated to each planet of the week. 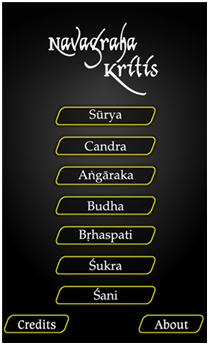 The app contains kritis on Surya, Candra, Angaraka, Budha, Brhaspati, Sukra and Sani . The Melodic Chants is another Windows Phone 8 App from the same team “Nextwave Multimedia Pvt Ltd” and is meant for childrens where the childrens can sing along with the tune and learn. 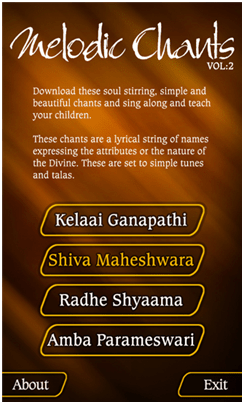 The lyrics and the meanings are also provided in the app which makes it easy for the user to understand and learn the chant. The Melodic Chants is priced at Rs. 55 and can be downloaded from the Windows Phone Store.